Bon Voyage! Set sail on the high seas and keep your luggage clearly identified with this cruise ship luggage tag. 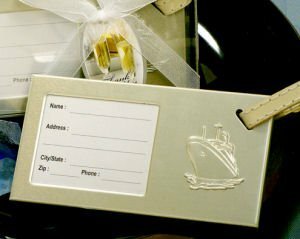 Each pearlized silver tag features an embossed cruise ship and cream-colored leather strap for attaching to your luggage. The tag measures 2 1/2" by 4 1/2" and includes an address label ready for you to fill out. 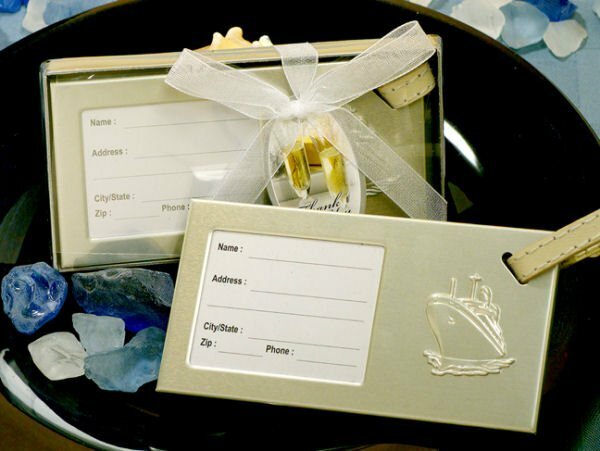 Each favor is also individually packaged in a black gift box with clear top, white organza ribbon and thank you tag. Would it be possible to get one as a sample. We are having our annual company's conference and I would want to make sure the quality is in line with our standards, only because of the reviews. they will be gifts to our 300 employees. Also, do you engrave if we want our name on them. Please respond at your earliest convenience. Sample orders can be ordered on our website by entering 1 qty to your cart. This item cannot be personalized.